And now for a quick disclaimer. As much as I love this quote, it feels a bit simplistic too. I would add some items to Ms. Godlberg’s list. Things like, take workshops. Read books on writing craft. 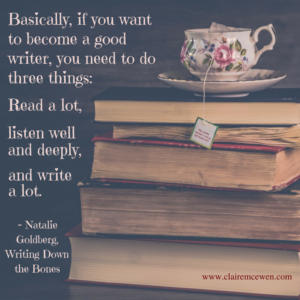 Make decisions about what genre or sub-genre you want to write. Read similar books. Keep a notebook for ideas. Get to know other writers. Maybe find a critique group or partner. Revise, revise and revise some more. 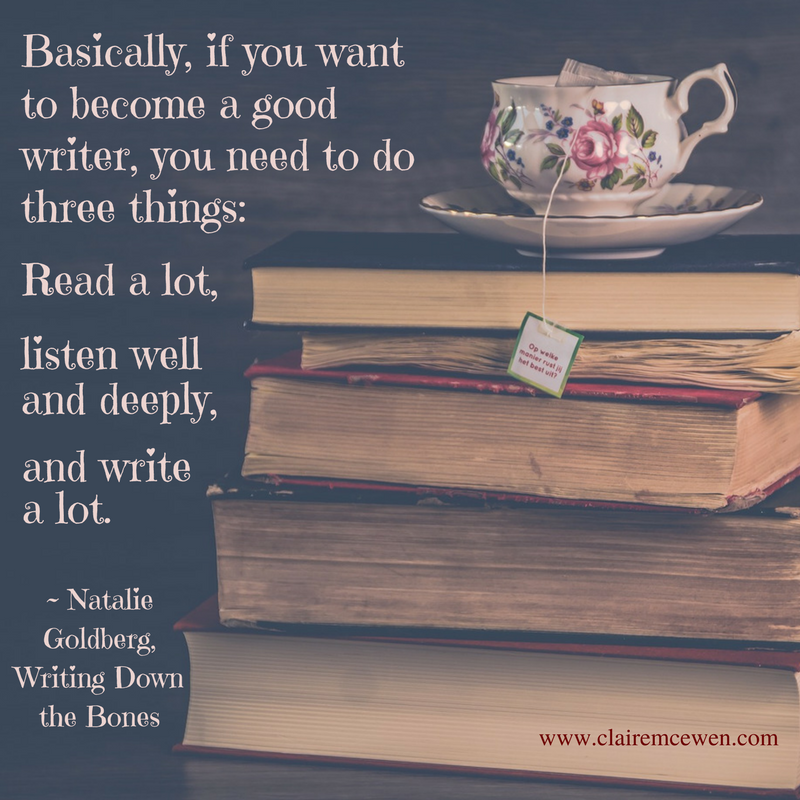 But Ms. Goldberg did capture some essentials here, which is why I love this quote. Reading is so key. I read all the time. It fills my soul but also, when I read something amazing, it challenges me to write better. When I read something that doesn’t work for me, I get to think about why that is, and how I can avoid the same pitfalls. I read to expose myself to different styles, different voices, different ideas and approaches. And listening is important too. I take that part of her idea in two ways. One way is listening to people around me. I collect quotes, conversation snippets, tones and pitches, funny sayings and dialects. I am the person who will suddenly fall silent in a restaurant because I’m listening in on the people at the next table, not to be rude or intrusive, but to soak in a perspective different than my own. And then there is making time to listen to yourself. Walks by myself with my dog give me time and space to think about my story, to ponder places where I’m stuck or to come up with new ideas. I’ve had friends and neighbors see me out walking and tease me later on about how serious I looked. Well, yeah, I was working hard out there! And then there’s writing. A lot. Ms. Goldberg makes a very important point and as a skilled procrastinator and slacker, I can testify that she is right! The more I write, the better I get, and the more ideas flow. Writing and creativity are like a muscles that work well as long as they get exercise. Writing fuels writing. Thoughts fuel thoughts. Imagination fuels more imagination. When I slack off, and avoid writing, I get out of shape. And it’s slow-going when I try to get back into the habit. So, read a lot. Listen. And write a lot. Plus do all that other stuff I mentioned earlier in the post. And I guarantee that you will see changes in your work, in your words, and in your stories.